Just wanted to share an Instagram challenge that I kicked off on Monday. Over the holidays I tend to overdo it a bit. I go to bed too late, I eat way too many treats, and I don't fit exercise in nearly enough. I might have baked (and sampled) all afternoon and then think... "Oh, I've been on my feet all day. I'm tired and I've gotten enough of a workout in..." and then I'll skip my run. Last year over the holidays I had a newborn, a very emotional two year old, and an energetic four year old. I imagined doing tons of exciting things together and really enjoying our family time while my husband had time off from work. Instead, I got too little sleep the week before Christmas (I had a newborn after all), ate too many treats & way too little healthy things... and I wound up super sick on Christmas day. Then I proceeded to get two different rounds of a stomach bug and didn't recover until almost two weeks later. The holidays were really lame. That was the third Christmas in three years where I managed to be sick and feeling terrible. This year all I want for the holidays is good health and time to spend with my family and friends doing fun & memorable things. To make sure that I accomplish my goal, this year I am taking care of myself better and remembering that #imatter. If I am healthy (emotionally, spiritually, and physically), my family functions well. If I am not healthy... there is anger, grumpiness, frustration, sadness, etc. It is terrible. I can't reach out to other people in the way that I want if I am not healthy. When I don't feel good about myself I am less likely to help other people feel good about themselves. 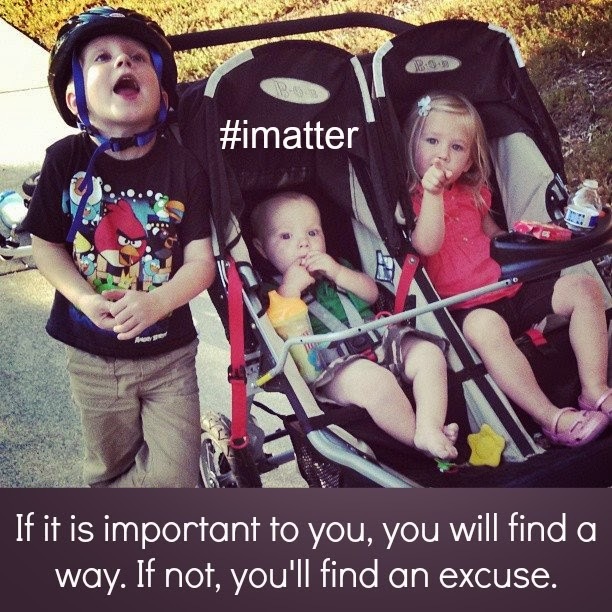 When I feel sluggish and tired I am not a great mom and my kids really don't like spending time with me. My six week challenge starts this week. You can still join in. Although we are doing the challenge on Instagram, you are welcome to still join in even if you aren't on there. Just post photos or info on my Toddler Approved FB page. I want all of us to have a holiday season that rocks and is filled with good emotional and physical health. 3. 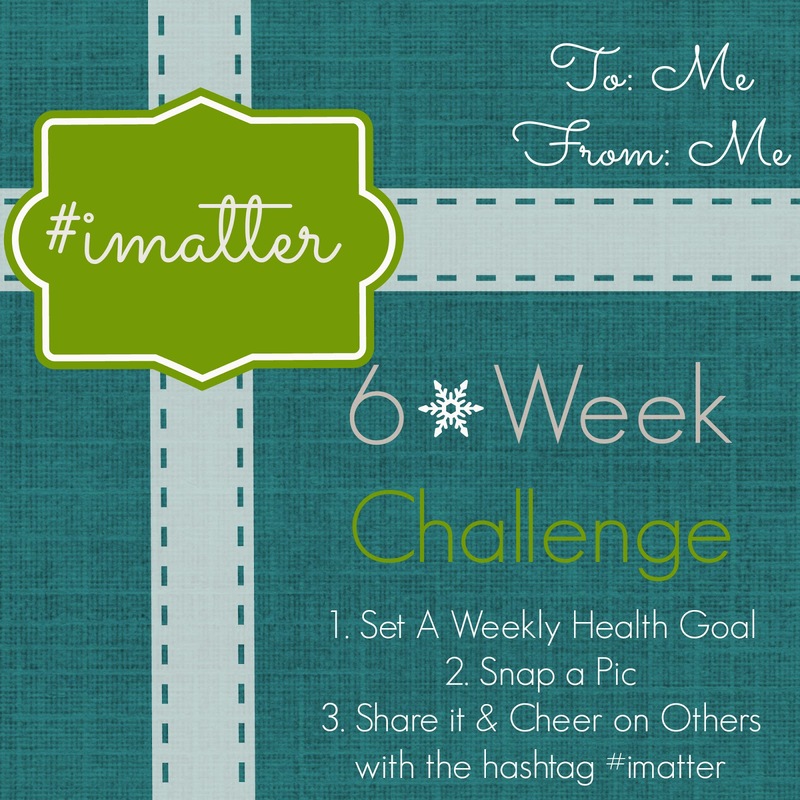 Add the hashtag #imatter and then go and find other people who are posting and cheer them on!!! Leave a comment here or on my instagram that you are joining in too and I'll check back in with you later in the week to see how things are going!! I want everyone to be successful! Make time for yourself this holiday season (and your health!) if you are struggling like me right now. Make time for YOU important. Work out, drink lots of water, take a bubble bath... whatever helps you stay sane & healthy and feeling good! Want to join in? Leave a comment and tell me. Our challenge starts this week and ends right before New Years. Yay Kim! So glad you are participating too! Awesome Michelle H!! So excited to have you joining in! I actually have that quote--"If It's Important To You..." taped to my mirror! I must have seen a hundred quotes over the years, but for whatever reason, that one has really worked for me. If I'm getting hung up on something, I ask, "Is this important? Does this matter?" If it's important to my family or to me or to work, I make it happen. If it's just something I'm getting obsessed with, I let it go. And---good luck with this Christmas! Happy and healthy, please! Thanks Matt!! Great perspective too. I need to remember that more often myself.